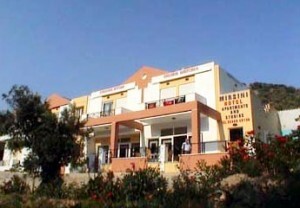 Mirsini Hotel is settled in municipality of Plomari and is the ideal place for real, unforgettable vacation. The comforts that are offered you are many. Just 2,5 kilometers away from Plomari, close to the wonderful beach of Agios Isidoros. Hospitality and owners’ generosity will make your stay more pleasant. 10 Studios for 2-3 people. 7 apartments with 2 bedrooms ideal for 4 people. 1 big apartment with 3 bedrooms, 2 bathroom ideal for 6 people. All the apartments have television, full equipped kitchen, telephone, safety box and balcony with wonderful view. Also reception is at your disposal 24 hours a day, while room service is available. The hotel has cafe-bar, so as to drink fresh juices, cool refreshments or a relaxing drink as the night falls. Rent a car from “Makis Rent a Car” to see the around area. Mirsini Hotel has made a special where you can find the car or the motorbike you like.